Android Wear smartwatches have a new trick: iOS compatibility. Here’s how to set up the Moto 360 smartwatch with your iPhone, and what you can expect once you’re done. The Moto 360 launched in September last year, with the first version of Android Wear. Using your Moto 360 with iOS was only added in the very latest update, version 1.3, so you’ll likely need to update your watch. Access the settings menu, then scroll down to ‘About’. From here, find ‘System updates’. If an update is available, you can download it here. Be warned, this does take quite some time… but you’ll get a notification when the update is ready to go. Once the update is installed, reset the smartwatch so that you can begin pairing on your iPhone. 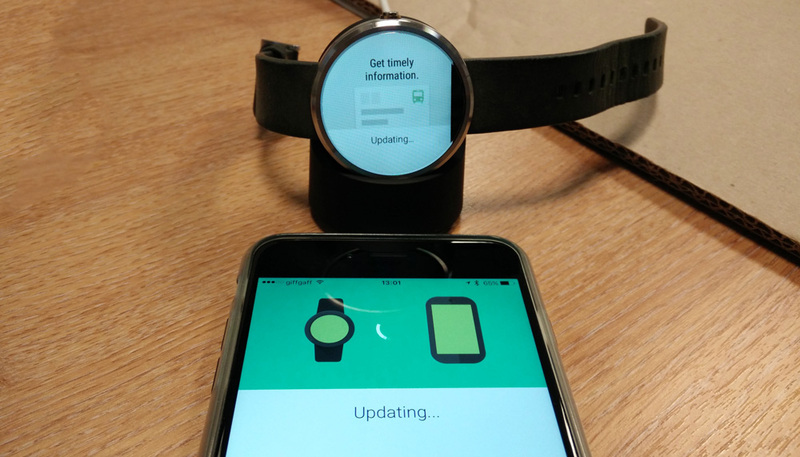 Of course, in order to update the Moto 360 in the first place you’ll need an Android phone. 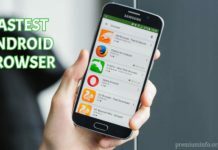 If you don’t have one yourself, then try borrowing a friend or colleagues for an hour or so – it only needs to be running Android 4.3 or later, which includes most phones made in the last year or two. Just pair with the Android phone, dash through the tutorial, access the Settings menu, trigger the update, and factory reset the Moto 360. Once this is complete, you can move onto the next step: pairing. To pair with your iPhone, you’ll need the Android Wear iOS app. Download it from the App Store (it’s just called “Android Wear”) and start it up. For this, you need an iPhone running version 8.2 or later (including the iOS 9 beta), which includes the iPhone 5 and later models. If your watch doesn’t appear in the Android Wear app, try restarting both the phone and the watch (after the usual step of making sure Bluetooth is turned on). For me, this prompted the Moto 360 to appear properly in the Android Wear app. 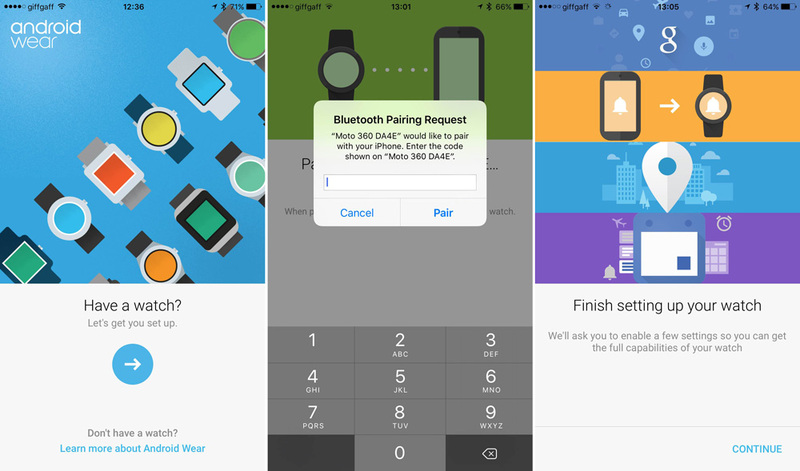 Once pairing is complete, your iPhone and Moto 360 will sync. You’ll get a nice video to watch in the interim, showing what your new pairing is capable of, as well as a few requests for various settings – enabling Google Now, accessing notifications, accessing location data and your calendar. 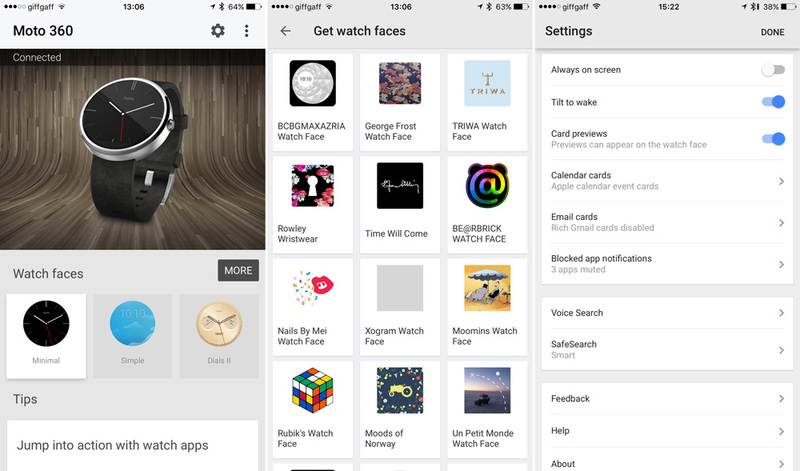 Finally, you’ll arrive at the main screen of the Android Wear app on iOS. So, what is possible with Android Wear on iOS? You can check the time, obviously, and you can choose from 11 stylish and customisable watch faces. You should also be able to install new watch faces from within the Android Wear app, but this didn’t work for me, just halting at the ‘downloading…’ stage. This may be an issue with the iOS 9 beta, so let me know if it works for you. You can also run apps by swiping left from the right edge of the screen. Your options include fitness apps, Google search, Google Translate, the weather, and of course various alarms and timers. On Android you would be able to install new apps to run on the watch… but on iOS, it looks like this isn’t (currently) possible. Another wrinkle is that while the watch tracks your steps, this doesn’t tie into any app on your iPhone. Notifications are the best thing about smartwatches, and sure enough all of your notifications are piped into the Moto 360. Unfortunately, after you’ve been notified about something, there’s usually nothing you can actually do in response. You can’t reply to emails or texts, you can’t launch the relevant app on your iPhone, you can only block that app from sending more notifications. Google Now cards do make an appearance here, and they’re useful as ever, providing timely information on the weather, your commute, parcels and other things that Google knows about you. Voice search also works, letting you find information or create to-dos without having to pull out your iPhone all the time. Another thing that works just fine on iOS are music controls. You can play/pause, skip tracks and adjust the volume, as well as see what song is currently playing. 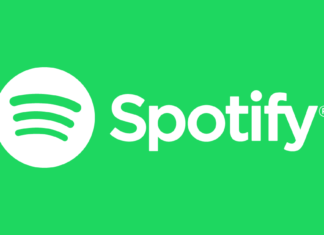 This works in Google Play Music as well as Apple’s Music app; I would imagine apps like Spotify and Tidal work as well as they all use the same control system. It’s cool that Android Wear works on iOS, but right now the combination is much less useful than an Apple Watch on iOS or the same Android Wear watch on Android. While Google’s efforts here are commendable, Apple’s restrictions ultimately result in a severely compromised experience. Feel free to try it yourself, but right now I can’t recommend anyone rush out and buy out a Moto 360 for their iPhone. Thanks for reading the article – we hope you found it helpful! If we didn’t cover something or you have any questions, feel free to share them in the comments below. We’d also love to hear from you if you got your Moto 360 paired with your iPhone using this method! Thanks again and have a great week.